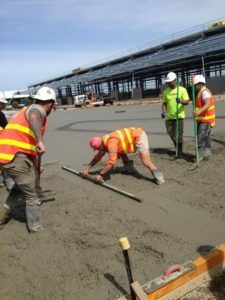 We are experienced in all types of commercial concrete. Whether it be large concrete placements, slabs, car parks , steps or retaining walls. We have team equipped to take on all size jobs. Larges slab such as schools, factories, car shops and industrial estates are where the big large slabs are mainly done. We will require a copy of the plans and a detailed explanation on the scope of works to price the job accordingly. Depending on what relationship we have with the customer, will also determine what type of payment terms and also whether or not we provide labor only packages or a full structural package. Carparks and basements are normally large areas of factories or multistorey developments. We are experts in these types of projects and can offer great advice on how we should approach your job. Drainage falls, thickness, reinforcement and finish are all very important features of this type of concrete construction. We have a great crew for concrete placement only packages. We have great finishes and all the equipment for a great burnt concrete floor! We offer competitive SQM rates so please get in touch to talk about your placement job.